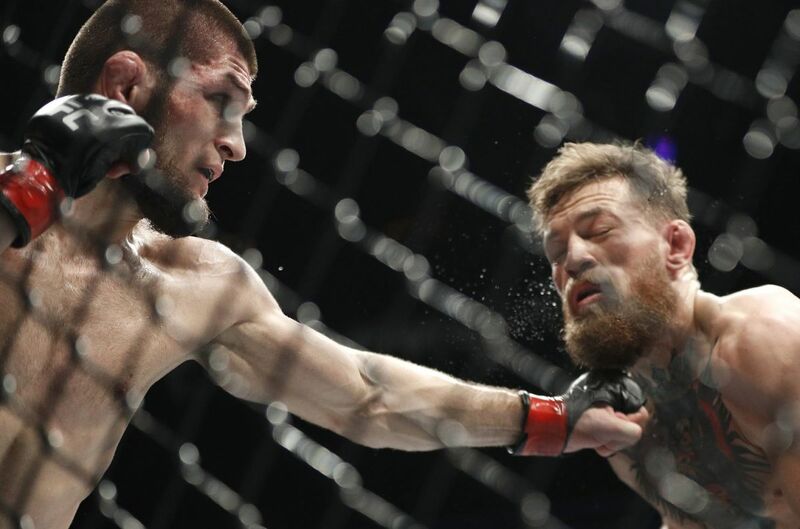 Khabib Nurmagomedov defeated Conor McGregor by fourth round submission to retain the UFC lightweight title at UFC 229, but it was what happened after that finish that has the world talking. Immediately following the victory, an emotional Nurmagomedov was talking to McGregor to the point referee Herb Dean had to pull him away. He then threw his mouthpiece at McGregor's corner and started yelling at them, leading to him jumping the cage and getting into a scrap with McGregor teammate and current Bellator fighter Dillion Danis. To say what happened at that point was chaos is an understatement. Fights involving men from both camps spilled in and out of the cage with one of Nurmagomedov's men jumping in the cage and hitting McGregor several times. After several minutes, security was able to separate everyone and eventually, McGregor was escorted to the back. What followed that was another shock as Dana White told Nurmagomedov he would have to head to the back before the official announcement for fear of fans throwing things in the cage. Eventually, the announcement was made by Bruce Buffer but with no fighters or corners in the cage, completing a stunning sequence to what was an eventful night. The fight itself was nearly as advertised as Nurmagomedov was dominant on the ground from the start, holding McGregor down and wearing him out. The former champion got his shots in on Nurmagomedov, but they weren't enough to hurt him. The second round was a dominant one for Nurmagomedov due to his ground work. Early in the round, Nurmagomedov nailed McGregor with a hard right that hurt the Irishman, leading to another takedown and more ground work. At one point, he was landing so many shots from the top that a stoppage was in sight. McGregor was able to eventually get back to his feet, but couldn't do much else. Surprisngly, the third round was nearly all on the feet with Nurmagomedov content to stand and trade with the tiring McGregor who got his shots in but without the pop of the first round. McGregor was able to fend off Nurmagomedov's few takedown attempts, but both men got admonished for inactivity. Early in the fourth, Nurmagomedov went back to his early game plan, riding McGregor down the canvas. With two minutes to go, Nurmagomedov locked on a face crank that got McGregor to tap. Then, the aforementioned hell broke loose. Dave Meltzer and Bryan Alvarez will have much more on this on the newest edition of Wrestling Observer Radio.